Chocolate for breakfast is the ultimate indulgence. You feel sinful just thinking about it. And chocolate and peanut butter together? Forget about it! That would be too much like eating a peanut butter cup and you wouldn’t dare stoop so low. You have your standards, after all. t But the reality is that chocolate, with all its antioxidant properties, has a good solid place in a healthful diet and you should take every advantage of that fact. Swap out all the sugar and carbs, and chocolate is actually quite a sensible breakfast after all. 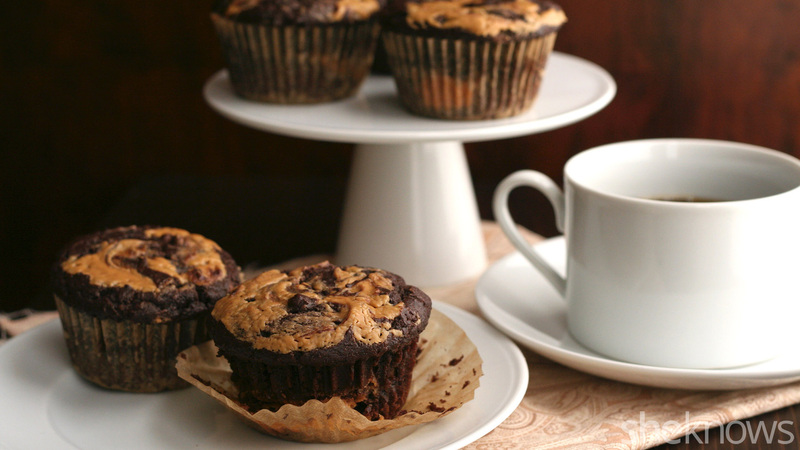 These chocolate peanut butter swirl muffins certainly taste sinful, but coming in at less than 5 grams net carbs and under 300 calories each, they fit right into your healthy diet. Preheat oven to 325 degrees F and line a muffin tin with paper liners (I recommend parchment liners for easy release). In a large bowl, whisk together almond flour, sweetener, cocoa powder, whey protein powder, baking powder, instant coffee and salt, breaking up any clumps with the back of a fork. Add eggs, butter, almond milk and vanilla extract and stir until well combined. In a small microwave-safe bowl, heat peanut butter on high in 30 second increments until melted and smooth. Divide half of the muffin batter between the prepared muffin cups. Spoon about a teaspoon of peanut butter over each and swirl with a knife. Top with remaining batter and remaining peanut butter and swirl with a knife. Bake 20 to 24 minutes, until set and a tester inserted in the center comes out clean.